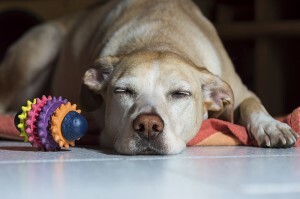 Veterinarians are often asked whether it is safe to administer aspirin or similar non-steroidal anti- inflammatory (NSAID) agents like Tylenol to dogs, in order to alleviate pain and inflammation. While the accurate answer will vary (depending on the clinical situation, life history of the patient, including medical history, current drugs/allergies, etc.) for the most part I do not recommend that animal guardians give aspirin to their pets at home, without first consulting with a veterinarian who is familiar with their animal. Inappropriate use of aspirin or related products may lead to unwanted side effects or reactions in some patients, including digestive upset (i.e. vomiting or diarrhea) internal bleeding, and/or liver/kidney complications. It is for these reasons that I recommend that animal guardians restrict use of home pain relieving medications to more natural supplements. Caution, though is needed, as even some natural products may have side effects, so it is usually best to consult with a veterinarian knowledgeable in both holistic and traditional veterinary medicine, before administering products like aspirin to dogs on their own at home. Natural pain relieving alternatives include supplements such as Zeel (formerly known as Traumeel), as well as turmeric, and antioxidants like grape seed extract (Proanthozone), which reduce inflammation by reducing formation of free radicals in the body. In many cases I will sometimes use the over-the-counter herbal supplement known as White willow bark, which is actually known as herbal aspirin; however, again it is best to be using this product under the supervision and care of a holistic-minded veterinarian. Finally, I have used the product Dog Gone Pain in many cases for pain and inflammation in dogs, and have found this product quite helpful and safe in most cases.